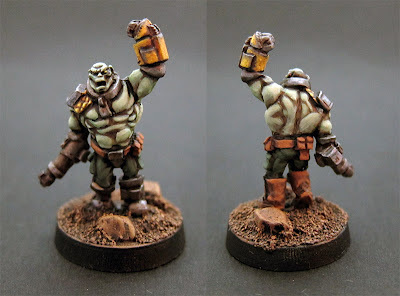 I just want to collect all of Khurasan's Post apoc miniatures, they are just perfect, and with your very nice painjobs its just irresistible. I had them all until the power armor came out.. Now I need more! Kings miniatures uses a similar technique for painting his retro-fantasy collection. Grey base and shading, then washes and tints to give colour. It's a great technique for monsters and things with a lot of skin. I used light base colors, not a grey shaded base as is popular. I don't think it's worth going the grey shading route for a 15mm figure, as contrast is so much more important. Washes are a great tool, but I don't think I'll be switching to an all-wash method. Beautiful job! Those washes came out great. Cheers Joe, some more coming up! Very nice, Jacker! This technique is working well with you. He definitely looks crusty. Great looking guy, I love the rest of the line, and already have an order in for this guy. Great paintjob as always, and thanks for the large picture! BEautiful. Nice to see a warboss for these guys. Nice to know that even John can surprise you, his best painter. And washes rule, no matter the scale. Thanks guys, Jon announced quite a lot of my painting backlog today! As I get time I will post about all the stuff I've painted under wraps that is now out in the wild as of today. (Deep Ones, Devils, Alien Bounty hunters, imps and robot). You never cease to amaze, Jacker! Everything you paint looks so clean and accurate-another triumph! Credit to the sculptor.. The clearer the detail. the easier it is to paint. This guy was a lot easier to paint then the Gang Task Force in my last post for example. I've been waiting on this fellow to place an order with Khurasan. I didn't know about the "government troops" and a few other things. In all I just plopped down $50. But it's a good thing, all excellent stuff. I don't think this model is a good candidate for a "clean" paint job, I like my Post-apoc stuff a bit messier. But it is a great job. I normally paint pretty clean, but I tried a battered look to his power fist by using the same technique as I did on my rusty mechs. Metal and dirty wash, then yellow stippled onto the middle of each plate. I like how it looks and it's really easy! Nothing wrong with a good Waagh!